Folks Kitchen menu prices are just as affordable today as they were when they first opened. Since Folks Kitchen first opened their doors in 1978 in Chamblee, GA, they have developed a reputation for serving delicious and authentic Southern style cuisine. In addition to the fried chicken and sweet tea that originally made Folks Kitchen a favorite of diners in the area, the restaurant serves plenty of other Southern comfort foods, including slow-cooked chicken and homemade dumplings, chicken pot pie topped with a flaky crust, gizzards or livers with a side of white-pepper gravy, and meatloaf that manages to be juicy, moist, and flavorful. Below are the latest Folks Kitchen menu prices. 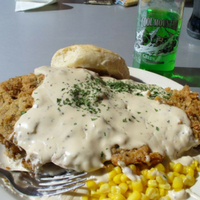 Diners who prefer something a tad less “country” will appreciate their entrée options, such as BBQ ribs so tender they fall off the bone, oven roasted turkey and cornbread dressing, slow-cooked pot roast, fried or grilled pork chops, and their famous country fried steak topped with white pepper gravy. Folks Kitchen also serves catfish, both whole and cut into filets, as well as shrimp and fried or grilled tilapia. Vegetarians can take advantage of the numerous vegetables on the menu to create their own plate. Vegetable and side options include slow-cooked pinto beans, baked macaroni, and cheese, squash casserole, corn on the cob, fried pickles, potato salad, cole slaw, glazed carrots, steamed broccoli, and a true southern treat, fried green tomatoes. Folks Kitchen also offers several dessert options, including their famous blackberry or peach cobbler, banana pudding, fried apple pie topped with vanilla bean ice cream, and Mississippi mud pie, which chocolate lovers are sure to appreciate. Today, Folks Kitchen remains a popular restaurant, particularly in the North Georgia and metro-Atlanta areas. Thanks to the restaurant’s laid back atmosphere and no alcohol policy, it is definitely a favorite of families. Currently, they have seven locations to choose from. Regardless of which one you choose to dine at, you can expect a “down-home feel,” big portions, and fast, friendly service. For more information about Folks Kitchen, visit their official website.